Vancouver police say they're aware of bullying and abuse allegations against a man who used to coach the Whitecaps women's soccer team, but won't confirm if they're investigating. The comments come as the Southsiders, the main supporters group for the Whitecaps, prepares for a protest Wednesday over how the club has handled the claims, which date back to the early 2000s. "What I can tell is that we have been made aware by the Whitecaps organization of the blog," said Sgt. Jason Robillard, referencing a website where the allegations were published earlier this year. "Since then we haven’t been releasing any further information. We want to encourage anybody that feels they are the victim of any crime to report it to the police." When pressed, Robillard wouldn't confirm or deny whether an investigation had been launched. "I don’t think it would be appropriate either way but what I'm able to say is we have been made aware of the blog," he said. The unproven allegations involve the former coach of a youth soccer program in Surrey, who coached the Whitecaps women's team in 2008 and worked with the Canadian women's national team program. The coach did not immediately respond to a request for comment from CTV News Wednesday. The blog post, which was written by former soccer player Ciara McCormack, contains a string of allegations involving bullying and harassment against a number of coaches involved in women's soccer. In a statement, the Whitecaps acknowledged complaints were brought forward to senior management in 2008, prompting the team to hire an independent ombudsperson to conduct a review. "As you would expect, the Ombudsperson had access to players and staff to conduct confidential interviews and gather information on an anonymous basis. Upon conclusion of the investigation, while the Ombudsperson had no recommendations for further action, the club and coach parted ways," the club said. The team reached out to police at the start of April in light of new allegations. "We were concerned there may be new information related to this matter that did not come forward in 2008 or since. 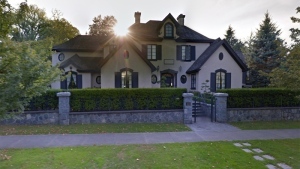 Therefore, we immediately contacted the Vancouver Police Department (VPD) to ensure they were aware of the blog and could assess if further action or review is required. Since then, we have been in active communication with the VPD to offer our full and ongoing support and cooperation. As the matter is now with the authorities we encourage anyone with information that may be helpful to reach out to VPD directly," the Whitecaps said. The team said as part of its commitment to the safety and well-being of players and staff, it's initiating an independent third-party review and assessment of its workplace policies. But McCormack criticized the response by the MLS team, calling it "disappointing." "We're so deep in to this and we really want real change and we really want real action points and not that fluffy corporate type of speak. I don't think their response is anywhere good enough in terms of actual concrete things that will help athletes moving forward," McCormack told CTV News on Wednesday. Instead, she says the Whitecaps should reveal their ombudsman report from 2008. "If there's actual real commitment to getting to the bottom of this, that would be a start," she said, adding that there should also be third-party support for younger players. The Southsiders – the main Whitecaps supporters group – is planning to walk out of the match in the 35th minute in tonight's game to protest how the team has handled the claims. The group said their protest is firmly directed at the team's management, not the players or coaching staff. This is not a protest aimed at our players, nor the technical staff, nor the many earnest and hardworking employees of the Whitecaps. Our dissatisfaction is aimed squarely at the executives who were in charge of the club in 2008 through to the present day," the Southsiders said in a statement. "Their silence and lack of accountability in this scandal, as well as the urgent need for better protection for young athletes in all sports compels us to act." When questioned about the limited nature of the protest – the group plans to return to their seats after halftime – a spokesperson said the Southsiders are prepared to step up their protests. "Protests of this nature are disruptive, we all want to be enjoying the match, we wish we didn't have this issue surrounding our club," said Paul Sabourin-Hertzog, the group's vice president and member-at-large. "We're starting with this limited walk out as a first step and we're prepared to take further action as necessary." 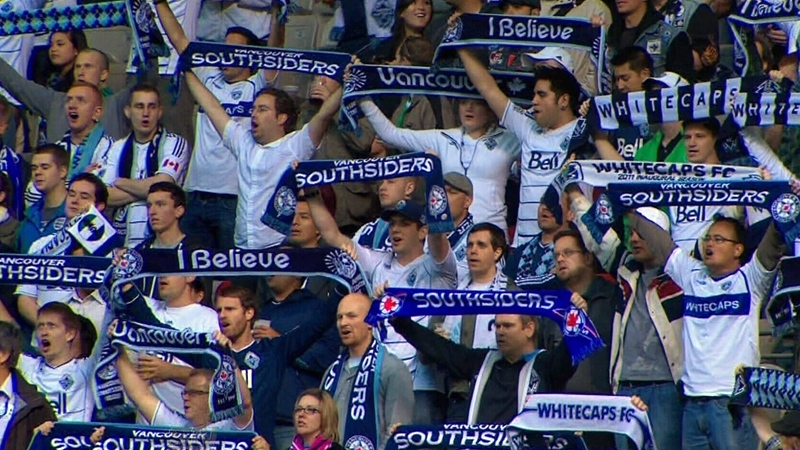 The Southsiders are seen here in an undated image.